Next is the Hermit Formation (formerly called Hermit Shale), which contains more amounts of mudstone than sandstone and thus weathers into a broad terrace upon which much of the city of Sedona is constructed. Many of the easy or moderate trails in the Sedona area traverse the eroded expanse of this brick red deposit. Regional studies of this interval of strata show that the Hermit is related to other named formations to the north and that they all represent deposition on a river floodplain that was sourced in a mountain range in Colorado called the Ancestral Rocky Mountains. Debris deposited near the ancient mountain front in western Colorado and eastern Utah is very coarse-grained but as the deposits are followed out to the southwest in Monument Valley, they become finer-grained. In Sedona, the Hermit is fine-grained and that is why it erodes so easily to create the aforementioned terrace. You can observe the Hermit Formation in the road cuts and trailhead at the parking lot at Midgley Bridge, and in other road cuts on Highway 89A west of the Sedona Post Office. The Schnebly Hill Formation is Sedona’s very own deposit and was formed in sand dunes that once fringed the shoreline of a shallow sea. This sea today is known as the Pedregosa Sea (Pedregosa is Spanish for “stony” but the name comes from a limestone layer that was first described in the Pedregosa Mountains in southeast Arizona – the two deposits are time equivalent and thus related). The limestone is quite thick in southern Arizona but thins to the northwest. This tells us that the sea was centered to the south of Sedona and that the shoreline was located here. Sand was blown in from the north across the Grand Canyon area and came to rest near the shoreline. In Sedona, the Schnebly Hill Formation has three subdivisions or members and each of them records minute details of the landscape here some 280 million years ago. 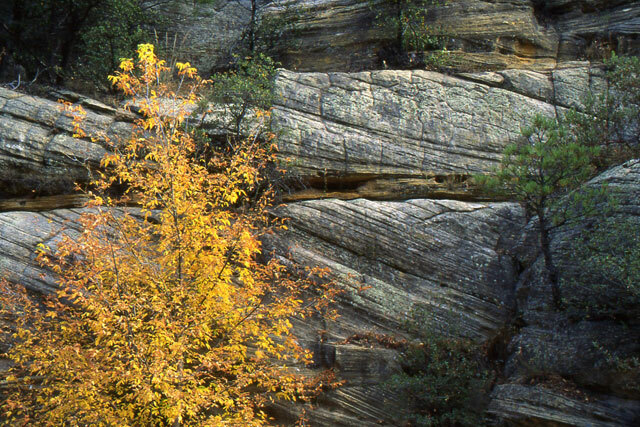 Below is the Bell Rock Member, named for exposures on this famous monolith near the Village of Oak Creek. This member contains flat-bedded sandstone that is interpreted as sand that was reworked by the tides of the Pedregosa Sea. Ripple marks and bedding style are used to determine that the sand was brought into the area by dunes but were flattened horizontally by the broad tidal zone that washed ashore here. Next is the Ft. Apache Member, named for limestone and dolomite rocks exposed near the famous Army fort southeast of Sedona (where it is much thicker). The Ft. Apache is only 8 to 10 feet thick here and completely pinches out west of Boynton Canyon. This is evidence that the Pedregosa Sea transgressed into the Sedona area for a brief moment in geologic time. Capping it is the Sycamore Pass Member, which is composed entirely of cross-bedded sandstone, showing that as the Pedregosa Sea retreated to the southeast, dune fields marched in from the northwest. The three-part make-up of the Schnebly Hill Formation gives us an intimate view of the geography of Sedona area at this time. Later sculpting of the rocks… well, we’ll get to that soon! Dune deposition continued in earnest as the Pedregosa Sea retreated farther southeast. By definition, the next set of dunes were inland dunes and the grains of the Coconino Sandstone were slightly larger, thus allowing future groundwater paths to flow through them more freely. This might explain why the Coconino is a whitish to buff colored sandstone – groundwater likely leached any of the red iron oxides out of it long before it was exposed to erosion. (The Schnebly Hill and other red rock layers are more finer-grained and thus not as much groundwater moved through them before they were exposed). The cross-bedding in sandstones always indicates the current direction in the ancient past (in this case wind current). Even though no one was around to witness what direction the wind was blowing, we know the wind came from the north because the cross-beds in Sedona dip to the south or southeast. Geology is nothing more than a detective mystery waiting to be solved! Another sea then began to encroach on the area this time from the west and left behind the two final deposits found today on the Mogollon Rim. The first is the Toroweap Formation, which is shallow marine in the Sycamore Canyon area but grades to the east into a beach and dune deposit in Oak Creek Canyon. The change in rock type in these 15 miles is subtle and undetectable in a single view but in Sycamore Canyon the deposit is composed of easily eroded layers of siltstone and gypsum, common in shallow sea environments today. 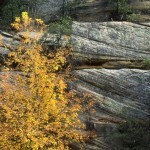 In Oak Creek Canyon, it is virtually indistinguishable from the underlying Coconino Sandstone, and is a cross-bedded sandstone. This lateral change in rock type in a rather short distance is the detailed information used to intimately understand the ancient setting at this time in the past, about 273 million years ago in this instance. As this sea transgressed farther to the east, it eventually caused the deposition of the Kaibab Limestone at 270 million years ago. This final deposit is rich in marine fossils such as brachiopods, corals, trilobites, and sponges. This final life form had a huge impact on the preservation quality of the Kaibab Limestone because sponges are rich in silica, which turns to chert within the limestone. This chert gives the Kaibab Limestone a steely strength in the modern desert environment and were it not for these ancient sponges, the Mogollon Rim might not have withstood the attack of later erosion, and the whole stack of rocks might have degraded at faster rates, thus making the profile of the red rock country much different than what we see today. It is amazing how some rather small details from the past can have such huge implications in the present. Thus is the magic of scientific exploration. With the deposition of the Kaibab Limestone, all of the pieces were in place to begin to carve the red rock country.